The first thing you notice when you walk into the 5-star Le Parc Hotel in Quito, Ecuador is its contemporary décor by Philippe Starck. 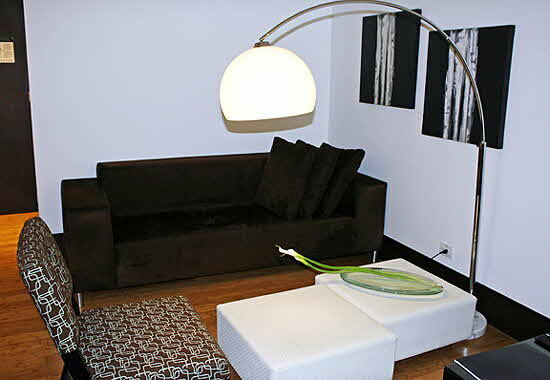 Opposite the elevator on my floor was a white leather wall, a square zebra print bench, and a silver and white arc floor lamp with a marble base. My suite had a living area with the same lamp over twin white, woven leather ottomans that contained a large, flat, oblong vase with two white calla lilies. (I’d love to have one of those vases!) There was also a plush velvet couch, a chair, and abstract paintings. The king-sized bed’s soft, white, woven leather headboard matched the living area’s ottomans. In between the living area and the bed was a glass-covered black lacquer desk attached to a matching coffee table. In the portion of the suite beyond the foot of the bed was a large, deep, free-standing bathtub that sat across from the closets. Even the minibar and bathroom were unusual in design. The minibar, which sat within the wall opposite the desk and under the wall-mounted television, was tall and narrow with two stylish brown cabinet doors. 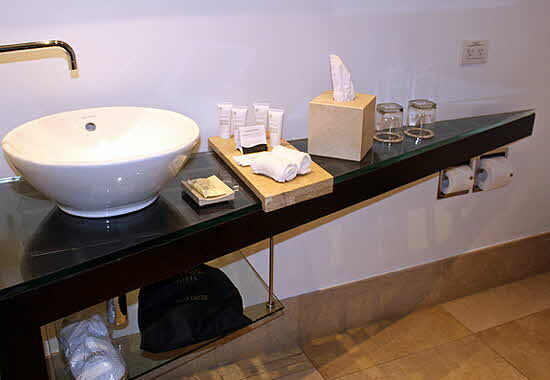 The bathroom contained a shower and a black marble, V-shaped counter that was wide where it held the white, round bowl sink and narrow where it held the amenities. Speaking of the bath amenities, they were by a company called Kuno, which uses native Andean extracts, quinoa, and Argan oil in its formulas. 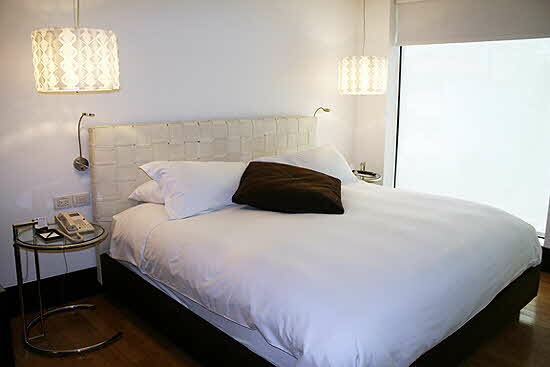 The décor is appropriate considering the location of Le Parc Hotel in the business and financial district of the city. I had been to Quito many years ago but stayed in the historic section, so I had never seen this modern, bustling area where the locals shop. The hotel is a short walk from the upscale Quicentro Mall and La Carolina Park. Le Parc is an all-suite boutique property with just 30 rooms. Junior suites are 345-463 square feet with two queen-sized beds or one king-sized bed like mine. Business suites are 463 square feet and have two environments for privacy, each with a bed, which allows the suite to accommodate three guests. The hotel provides free Wi-Fi and despite its boutique status, has a gym, a business area, a lounge, a spa with a sauna, a restaurant with a full breakfast buffet, event rooms, and a rooftop bar. That rooftop bar’s décor, by the way, is equally as impressive as the rest of the hotel. It contains tufted, deep green velvet couches and ottomans with orange pillows and lantern light fixtures. The spa menu doesn’t scrimp either. It includes massages, facials, body wraps, reflexology, exfoliation treatments, and special packages for brides, couples, and mothers/daughters. I ordered room service from the Neu Bistro Restaurant, and the food was excellent and well-presented. I had a simple burger, but it was on par with the best burgers I’ve had at other fine restaurants. Service was also fast and courteous. When it came time to check out, I especially appreciated the hotel’s car service to the airport, which only cost $25 one way, a price comparable to outside car services. So many hotels inflate the price of their airport transfers, so it was refreshing to find that Le Parc did not. For U.S. residents in particular, Ecuador is an economical destination. You can often stay in 5-star hotels for less than you’d spend elsewhere in the world. As of this writing, the suites at Le Parc cost less than $200 per night, even with breakfast included. By international standards, that’s an amazing bargain for such a luxurious property. 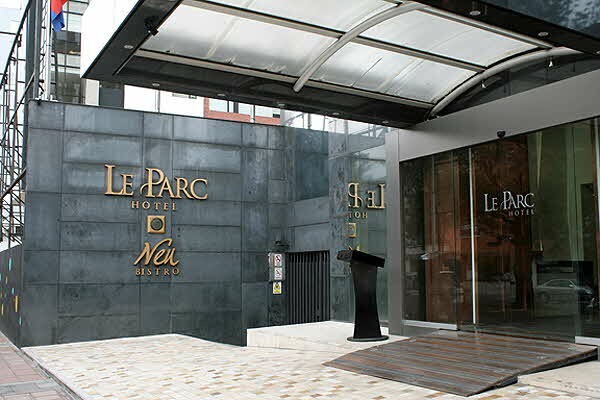 When I return to Quito, Le Parc Hotel will be my first choice when I want to stay outside the historic district.